In the last instalment [click here to read again], I gave a general introduction to Kodaikanal and included for you a clip from a recording of my conversation with Mr. V. Srinivasan, which offered glimpses of Swami’s return to Kodai in the early eighties. 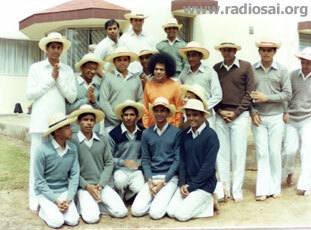 Today, let me offer you some glimpse of the first time Swami took some students with Him to Kodai. This was in 1987. By this time, a small plot had been acquired by the Sri Sathya Sai Central Trust, and a building constructed on the plot, that would serve as Swami’s residence when He visited Kodai. Dr. Siva Shankar Sai, currently a member of the Physics faculty in Swami’s Institute and also the Warden of the Hostel here in Prashanti Nilayam, was one of those who accompanied Swami then. Let us hear about that trip from Dr. Shiva Shankar Sai himself. Now why does Swami take students to Kodai? Here are two views of about that. First we hear Srirangarajan, a former student and now a teacher in Swami’s University. There is a popular saying that Prashanti Nilayam is Swami’s Office, Brindavan is His home and Kodai is His playground. Superficially it might appear so but behind all the fun, frolic and picnicking, there is a serious purpose, and that is what I wanted to bring out by playing for you clips of what Srirangarajan and Sainath told me. I should here mention that in the old days, Swami travelled by road. 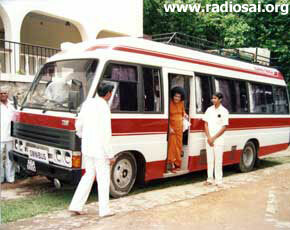 The students would all be packed into a bus while Swami would travel by car. In those days, not many elders accompanied Swami, as they do now. In fact, in the very first trip with students, it was almost entirely students, apart from two teachers and late Mr. V. K. Narasimhan, then Editor of Sanathana Sarathi. This way, Swami could devote attention totally to students. Later, Swami began taking a few elders, but even so, the attention was almost entirely on students. Soon, devotees began to flock to Kodai to have the Darshan of the Lord amongst those beautiful hills, and slowly, Darshan began to become an important component of the Kodai visits of Swami. Soon after this, Swami started calling people for interviews and when the original dining hall was extended, Bhagavan also began to invite people for lunch. I think it is appropriate at this point to get a broad overview of all this from Anil Kumar, the veteran of many a Kodai trip. That was a wonderful account of Swami in Kodai, was it not? The Kodai format keeps on changing constantly in terms of details but the basic purpose remains the same. In the next instalment, I shall begin my description of Swami’s latest trip that is, in April 2006. There you will find a corroboration of the statement that I just made.